Architect or source of design: Ekman Holm and Co. The Avalon Theater reflects the evolution of movie theaters on Lake Street. Opened in 1937, this art-deco movie house's modern exterior boasted thousands of neon lights that attracted attention for miles. 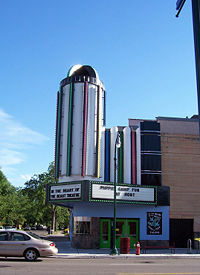 In the 1950's it morphed into the first European-art-film house, and a decade later, it became one of the first x-rated theaters in the Twin Cities. Since it's reopening in 1989 it has been the home to In the Heart of the Beast Puppet and Mask Theatre. I was born on March 12, 1939. The night before I was born my parents went to see "Gone With the Wind" at the Avalon Theater. On the way from our home at 2636 - 17th Avenue they stopped at Nolander's Department Store on 17th and Lake. where my mother wanted to buy some sewing supplies. She put her name in for a door prize that night and won a beautiful gold, red, and black tray with deer on it, which came with a pitcher and six glasses. The tray was in our family until I left home. Recently when I visited my niece's home I found out that she still has that tray. As a child I went nearly every Saturday to the matinee double features at the Avalon. Before the movies we had yoyo contests on stage with prizes. In the late 1940s yoyo was a great pastime for children like us, as well as roller skating and biking. Sometimes, much to my mother's dismay, I stayed after the whole afternoon of movies with cartoons to watch the evening feature film. In recent years I have returned to the now Heart of the Beast Theater to see puppet theater. It is wonderful to see the theater of my youth returned to a place for such wholesome entertainment.